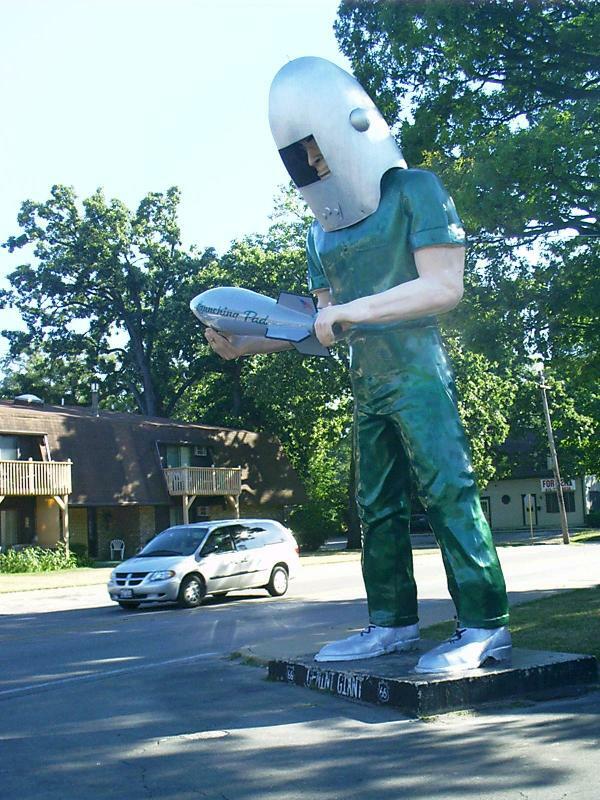 The Gemini Giant is a fiberglass mascot of the Launching Pad Drive-In Restaurant in Wilmington, IL. They give out that he is some kind of astronaut or spaceman or something, but I think he is a rogue nuclear power plant worker. Here he prepares to drop the Big One on SR 53 traffic. Since 9/11, administrators of strategic facilities have become increasingly sensitive to potential breeches of security and may react aggressively to inquisitive acts on the part of the public such as taking snapshots. Even though the Braidwood Plant stands adjacent to Old US Route 66, I've not dared to observe the occasions of my passage as photo ops. 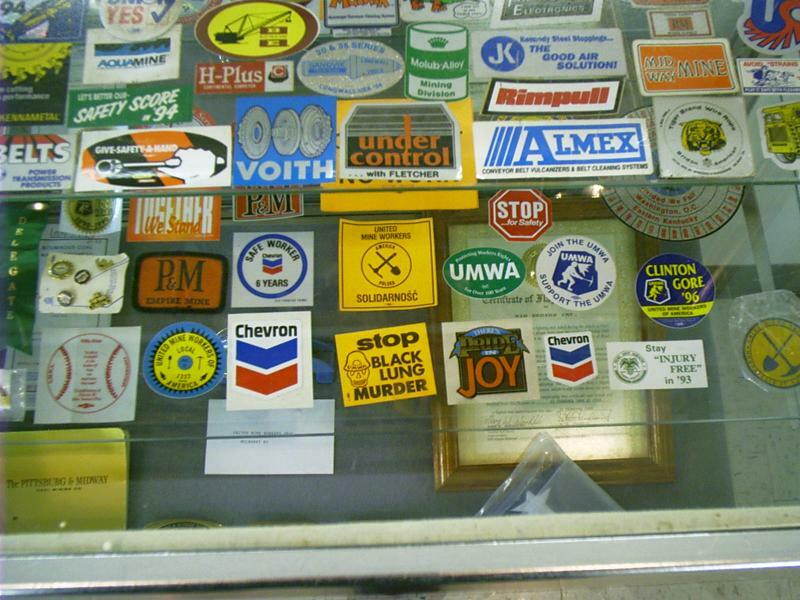 Old US Route 66 is a flea-market enthusiast's dream come true. 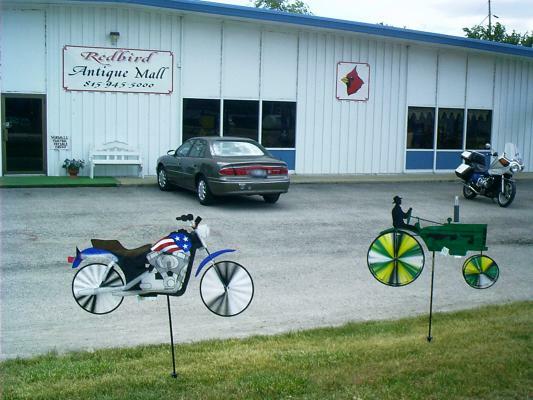 Now, I know Harley riders to be hep to the latest trends in yard art and paragons of good taste, so I'll leave it to you. (As a Goldwing owner, I'm clueless.) Is this cute, or what? Old US Route 66 tourists on their way south from Chicago must stop at the Route 66 Association of Illinois Hall of Fame and Historic Museum for free orientation and indoctrination. 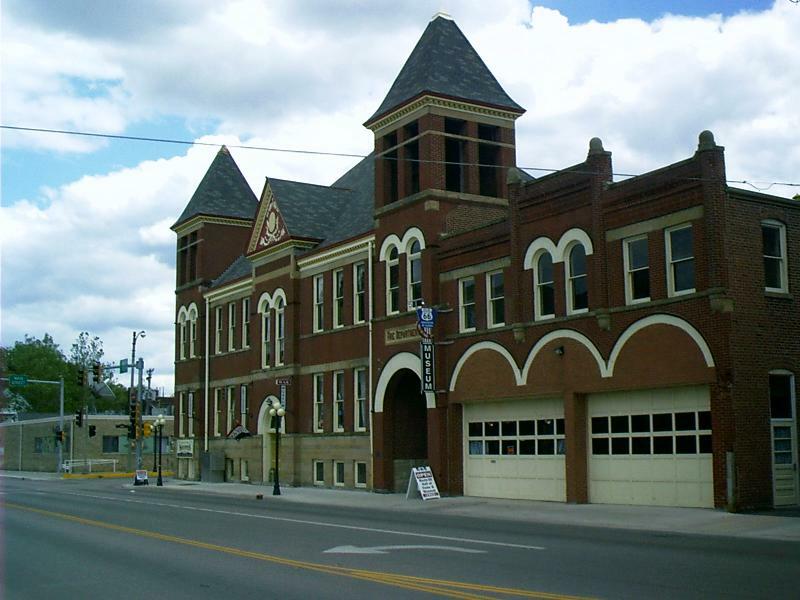 The museum is in the Old City Hall (not the Livingston County Court House). Likewise those headed east are to turn off at Clinton, OK, to visit the Route 66 Museum there. Admission is charged. One starts in the 1920s and progresses by the decade from one room to the next. The lights in each room come on automagically, revealing wall-sized photos of roadwork in progress. Tokens of each time period and memorabilia from long-gone roadside institutions are displayed, but you are responsible for poking the button that provides ambient popular music by well-known recording artists such as Frank Stokes ("'Taint Nobody's Business If I Do" 1928), Woody Guthrie ("Will Rogers Highway" 1940), Glen Miller ("In the Mood" 1940), Elvis Presley ("Heartbreak Hotel" 1956), The Beatles ("I Saw Her Standing There" 1963), and The Eagles ("Hotel California" 1976). Highway 66 is the main migrant road. 66 ~ the long concrete path across the country, waving gently up and down on the map, from the Mississippi to Bakersfield ~ over the red lands and the gray lands, twisting up into the mountains, crossing the Divide and down into the bright and terrible desert, and across the desert to the mountains again, and into the rich California valleys. 66 is the path of a people in flight, refugees from dust and shrinking ownership, from the desert's slow northward invasion, from the twisting winds that howl up out of Texas, from the floods that bring no richness to the land and steal what little richness is there. From all of these the people are in flight, and they come into 66 from the tributary side roads, from the wagon tracks and the rutted country roads. 66 is the mother road, the road of flight. Woody Guthrie (1912-1967) was a folk singer from Okemah, OK. Information about him on the Internet is not helpful for dating his lyrics. Although he performed on radio in his early years, he was never widely recorded, and he was later blacklisted for his radical political beliefs; nevertheless, tapping him as the icon of the 1930s is reasonable. He was responsible for the Dust Bowl anthem Dusty Old Dust. No doubt you have heard a performance or two by Pete Seeger (1916-) who is also a composer and folk singer (Where Have All the Flowers Gone). Seeger, though he hails from the East, was a contemporary of Guthrie and is somewhat more than a fellow traveler. In another version, the sign reads "Private Property." These verses were left out of subsequent recordings (even by Guthrie himself), turning what was a protest song into one more along the lines of the then-current style of patriotic songs. The melody Guthrie used for "This Land is Your Land" is the melody for the old gospel song, "When the World's on Fire." This song is probably best known as recorded by the country/bluegrass legends, The Carter Family, around 1930. Midewin (Mih DAY win) is the Potawatomi name of the Healers' Guild. The US Forest Service is reclaiming the vast grounds of the Joliet Arsenal where weapons of mass destruction were manufactured for World War II. 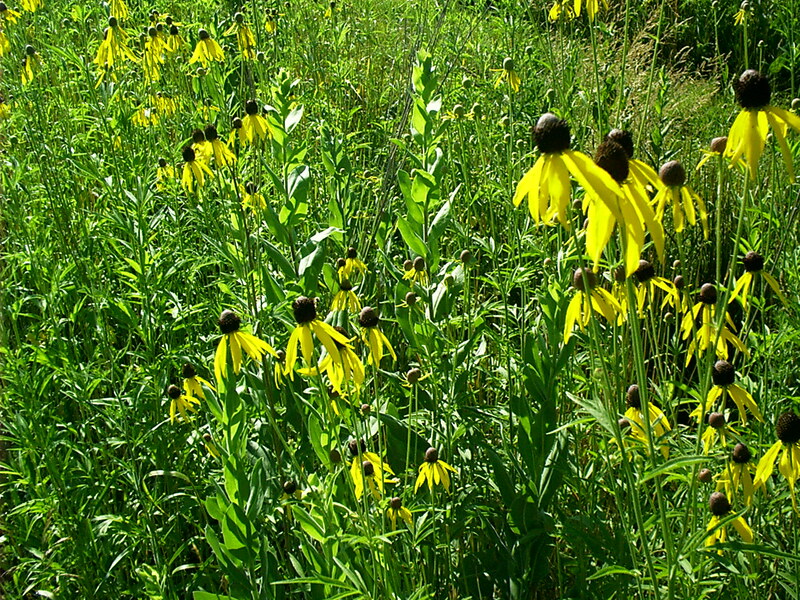 It has been renamed Midewin, and they are slowly turning it back into a natural prairie. Most of it is still in pasture or under cultivation. The project is expected to continue for decades. There is a small visitors' display in the office building and a short path around a pond in front of it. Those looking for seed sources and advice about converting midwestern waste areas to natural vegetation will be interested as will hikers. There are (or will be) miles-long walking tours over non-hazardous areas of the site. Check in at the reception desk. 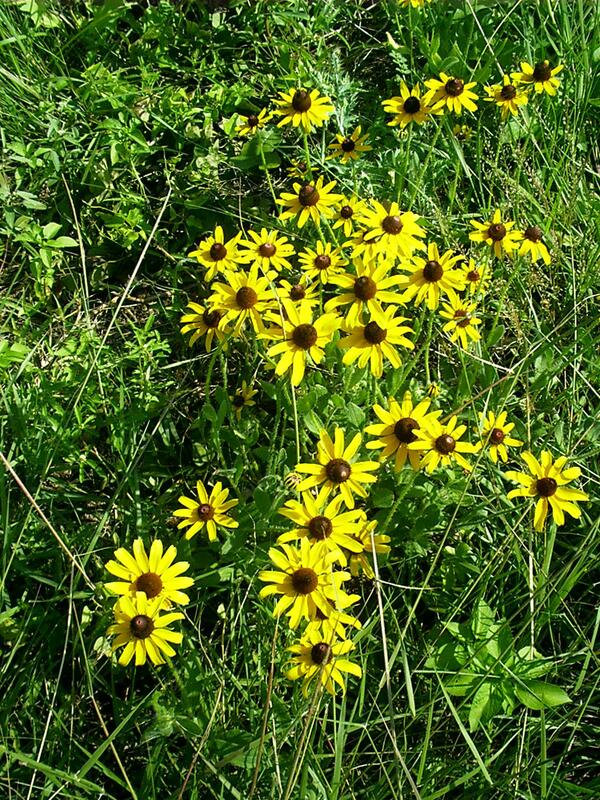 Keep your eyes open for wild flowers all along Old US Route 66. Spraying curtailed their variety, but some species turned out to be immortal. Others have been making a comeback, aided, no doubt, by local restoration efforts. 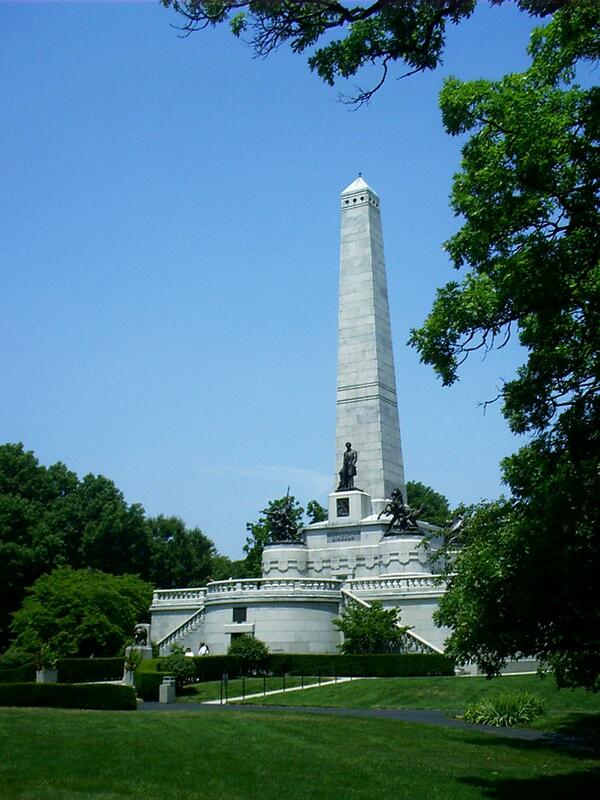 Internal and external deterioration of the Lincoln Tomb has prompted two reconstructions. The first began in 1899 and was completed two years later. At that time the height of the obelisk was increased by 15 feet, and the steel and concrete vault containing the president's remains was buried beneath the floor of the burial chamber. During the 1930 reconstruction the hallways were created, and a simple red marble stone was placed in the burial chamber to mark the president's grave. Eleven varieties of marble were used for walls and floors. Bronze statues and plaques were also added. I went in and asked, "How much?" "Thirty cents apiece," answered Mister Fischman. "I sell a carload a month of these." They are all for Abe and the "malice to none" stuff. "Maybe you want a lighter pair,"
"You are a funny customer." This is Abraham Lincoln's home town. 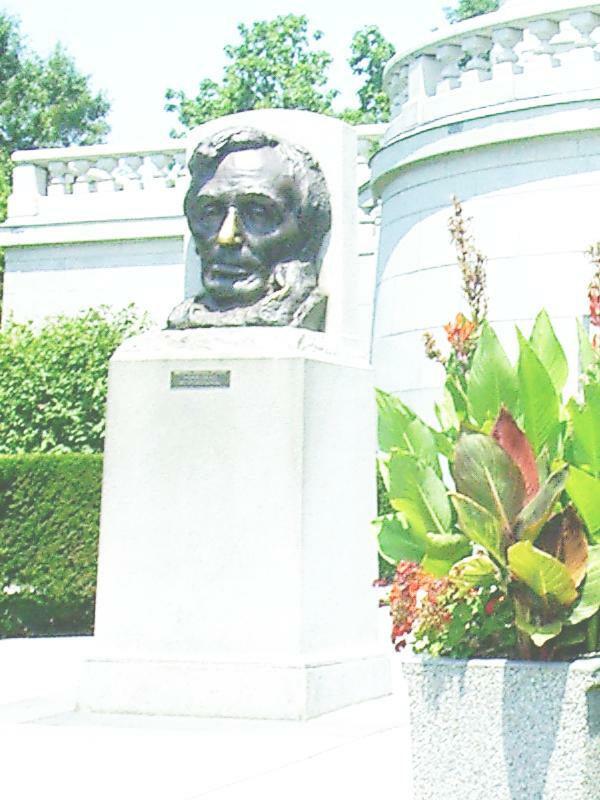 The bronze bust before the entrance to the tomb is a reproduction of Gutzon Borglum's marble head of Lincoln in the Capitol building in Washington, DC. Visitors are compelled to touch its nose for luck. Mary Harris "Mother" Jones was an Irish immigrant. Her husband and children died of yellow fever in Tennessee in 1867. She went into business as a seamstress in Chicago and was burned out in the Great Fire of 1871. 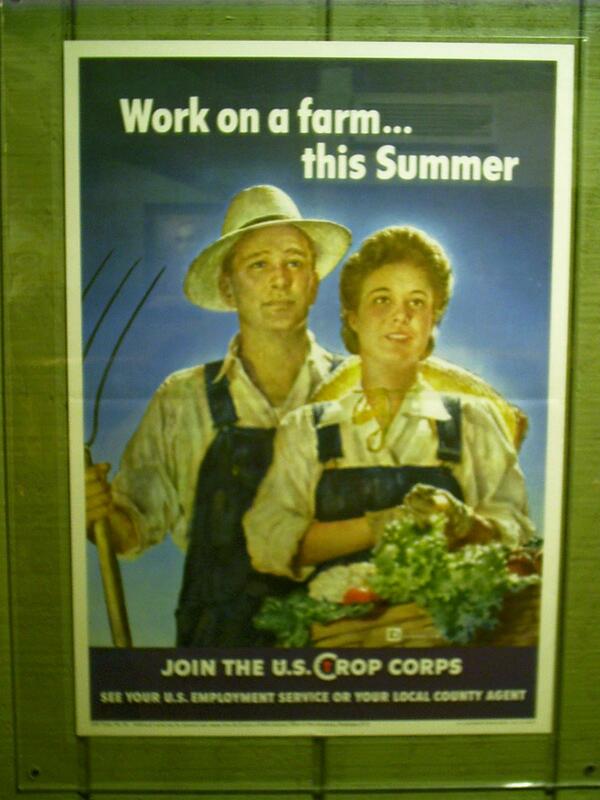 She then became an agitator for organized labor. She helped found the Industrial Workers of the World (IWW, the "Wobblies") in 1905. Mother Jones lost as many battles as she won, but still she got results. She was by far the most famous and charismatic organizer for the United Mine Workers. When she began working for that fledgling union in the 1890s, it had 10,000 members; within a few years, 300,000 men had joined, and she organized many of their wives into "mop and broom" brigades, militant women who fought alongside their husbands. In 1903, after she was already nationally known from bitter mine wars in Pennsylvania and West Virginia, she organized her famous "march of the mill children" from Philadelphia to President Theodore Roosevelt's summer home on Long Island. Every day, she and a few dozen children ~ boys and girls, some 12 and 14 years old, some crippled by the machinery of the textile mills ~ walked to a new town, and at night they staged rallies with music, skits, and speeches, drawing thousands of citizens. Federal laws against child labor would not come for decades, but, for two months that summer, Mother Jones, with her street theater and speeches, made the issue front-page news. We assembled a number of boys and girls one morning in Independence Park, and from there we arranged to parade with banners to the court house where we would hold a meeting. A great crowd gathered in the public square in front of the city hall. I put the little boys with their fingers off and hands crushed and maimed on a platform. I held up their mutilated hands and showed them to the crowd and made the statement that Philadelphia's mansions were built on the broken bones, the quivering hearts and drooping heads of these children. That their little lives went out to make wealth for others. That neither state or city officials paid any attention to these wrongs. That they did not care that these children were to be the future citizens of the nation. The officials of the city hall were standing at the open windows. I held the little ones of the mills high up above the heads of the crowd and pointed to their puny arms and legs and hollow chests. They were light to lift. I called upon the millionaire manufactures to cease their moral murders, and I cried to the officials in the open windows opposite, "Some day the workers will take possession of your city hall, and, when we do, no child will be sacrificed on the altar of profit." The workers started an agitation for an eight-hour day. The trades unions and the Knights of Labor endorsed the movement, but, because many of the leaders of the agitation were foreigners, the movement itself was regarded as "foreign" and as "un-American." Then the anarchists of Chicago, a very small group, espoused the cause of the eight-hour day. From then on the people of Chicago seemed incapable of discussing a purely economic question without getting excited about anarchism. The employers used the cry of anarchism to kill the movement. A person who believed in an eight-hour working day was, they said, an enemy to his country, a traitor, an anarchist. The foundations of government were being gnawed away by the anarchist rats. Feeling was bitter. The city was divided into two angry camps. The working people on one side, hungry, cold, jobless, fighting gunmen and police clubs with bare hands. On the other side the employers, knowing neither hunger nor cold, supported by the newspapers, by the police, by all the power of the great state itself. On the evening of May 4th , the anarchists held a meeting in the shabby, dirty district known to later history as Haymarket Square. The city went insane, and the newspapers did everything to keep it like a madhouse. The workers' cry for justice was drowned in the shriek for revenge. Bombs were "found" every five minutes. Men went armed, and gun stores kept open nights. Hundreds were arrested. Only those who had agitated for an eight-hour day, however, were brought to trial and a few months later hanged. She herself changed her birthdate at various times, always making herself older than she actually was. Mother Jones celebrated her 100th birthday on May 1, 1930, with everyone from the Rockefellers on down sending her congratulations. She died on November 30, 1930. She was 93 or 94 years old. The Union Miners Cemetery is linked to ... "The Virden Riot," ... a shootout with mine guards on October 10, 1898, as a train carrying 180 black strike-breakers recruited from the south, attempted to pass through a band of armed strikers and reach safety within a fortified stockade at Virden. The mine guards, imported from St. Louis, were better armed and had the advantage of the stockade. The firing was intense, lasting about ten minutes. The train's engineer was wounded, and he returned to Springfield with his cargo still aboard. Dead were seven miners and five guards. Forty other miners and four guards were wounded. The men from Mt. Olive were buried originally in the town cemetery, but the owner of the land objected to the ceremonies and other activities which the miners held there. The Lutheran cemetery was barred to them because that minister denounced the miners as "murderers." 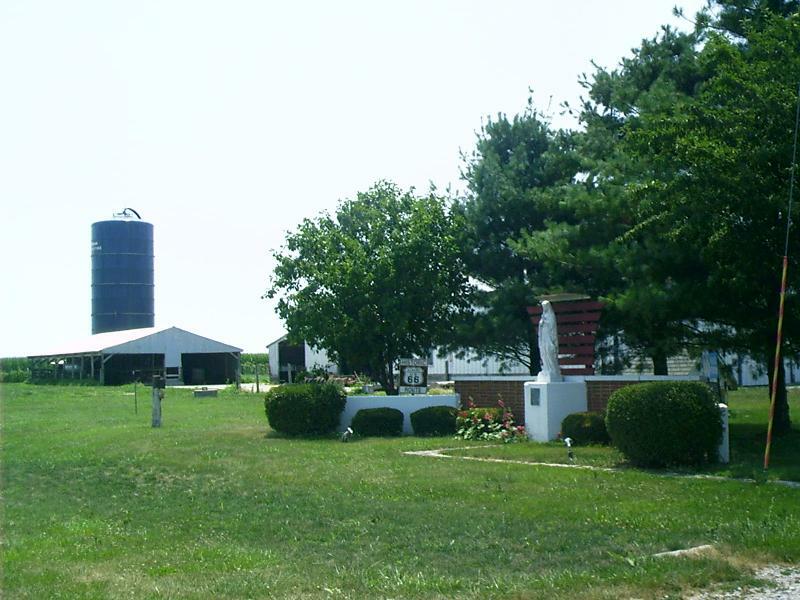 The local union, thereupon, purchased a one-acre site, and the bodies were moved to the new Union Miners Cemetery in 1899. 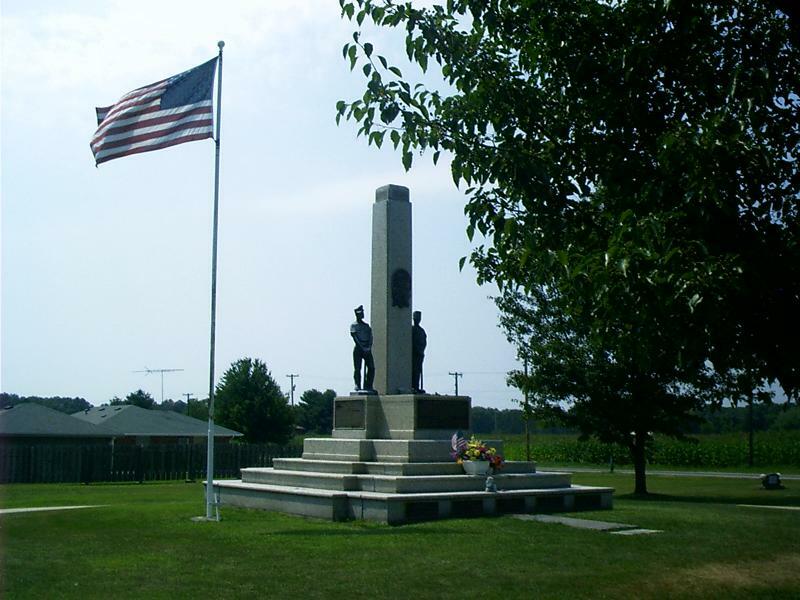 Additional land was acquired in 1902, and again in 1918 and 1931, in order to accommodate the monument [and grave of Mother Jones] which was dedicated on October 11, 1936. The dedication was, itself, a monumental event. Five special trains and 25 Greyhound buses brought celebrants to Mt. Olive. Others came in private cars or hitch-hiked to the town. The crowd was estimated at 50,000. There were 32,000 in the line of march. I've been in other caves. 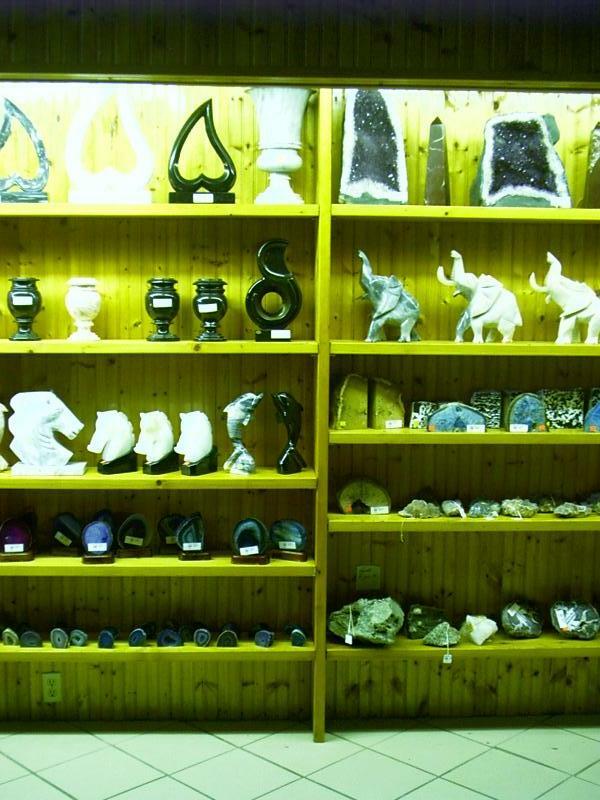 I've been in other "show caves." This was the nicest in terms of tourist comfort. First of all, it doesn't smell like a cave. They have some superduper citrusy substance that they must spritz into the air or slather on the guide rails or something. You just can't believe you're in a dank underground chamber. It never occurs to you that you are cheek by jowl next to a bunch of other sweaty tourists. Under the neon sign, which tells you where you are, there is a replica moonshiner's shack complete with still. 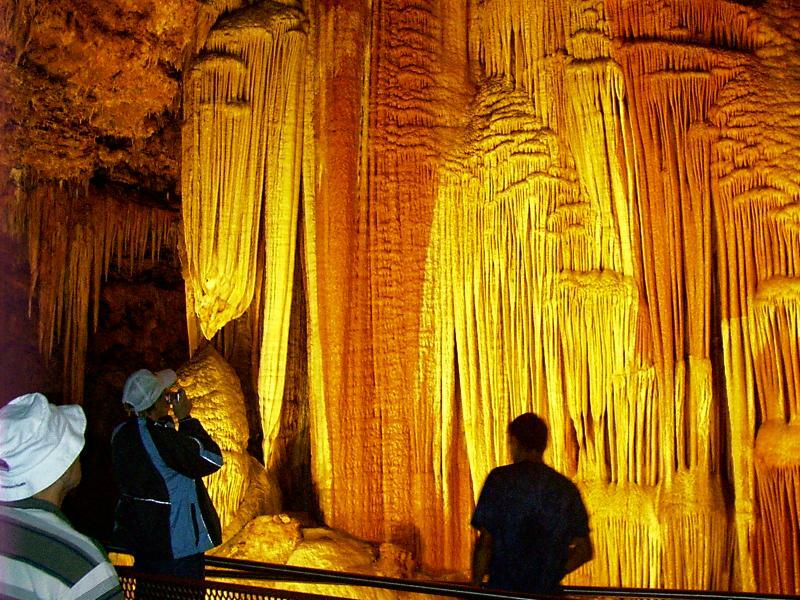 The tour guide frankly confesses this has nothing to do with the history of Meramec Caverns ~ political, social, or geologic ~ but is merely included as an Ozarks reference ~ so you know where you are. Likewise there is a Jesse James diorama. 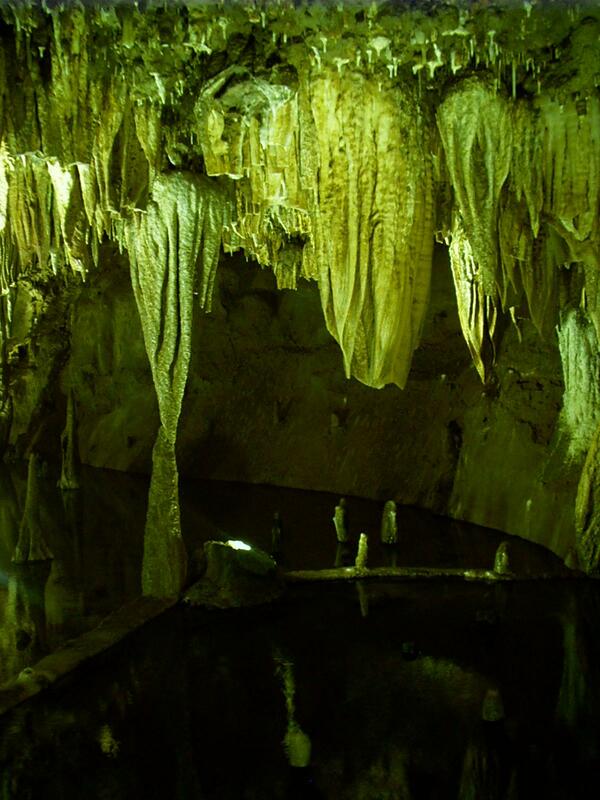 You have to walk past the cafeteria to get to the gift shop, which entirely encloses the mouth of the cave. In the old days, people would drive into the cave and dance on a grandstand built inside. Contemporary visitors may be forgiven for assuming that cave floors are typically flat enough not only to dance on but also to lay a tile floor on. There is an illuminated picture portrait of Lassie in the cave because an episode of the ever-popular TV series (starring Opie Taylor) was filmed here. You remember it, I'm sure. It's the one where Lassie rescues Timmy, or was it Flipper? Art Linkletter did a gag for his TV show in which a pair of contestants personated a prehistoric cave couple, performing a skit for the amusement of tourists. This is remembered with fondness and commemorated, too, with a stop on the tour and concomitant signage. There is even a Foucault pendulum installed in the cave for a local science fair. It is one of only 16 in the known world. It is the only one that doesn't work. It's too lightweight. It doesn't store enough energy to keep going long enough for the precession of the earth to be obvious. 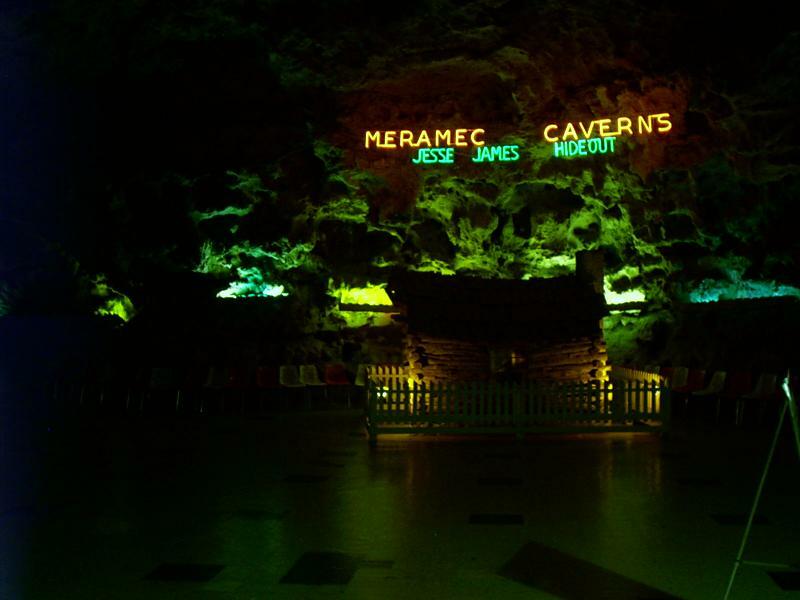 By now in my description, I've given you the idea that the Meramec Cavern tour is about anything other than the cave. This is not true. There's plenty of cave stuff in the cave and a river, too; you just have to walk for a way to get to it. Also, you have to climb stairs ~ one whole flight ~ so I ask you: If you were a guide in charge of a bunch of sweaty tourists, what would you talk about? The finale is a light show in a "room" with a curtain wall of flowstone (and theater seating). This is accompanied by a recording of Kate Smith (1907-1986) singing Irving Berlin's God Bless America. Apparently hers is the only performance that could ever shake loose a cascade of water from the flowstone. Kate Smith fans don't seem to feel that this is any kind of exploitation. I want to include an image not relevant to Old US Route 66 except for its Ozark connection and because its artist was a native of Missouri. 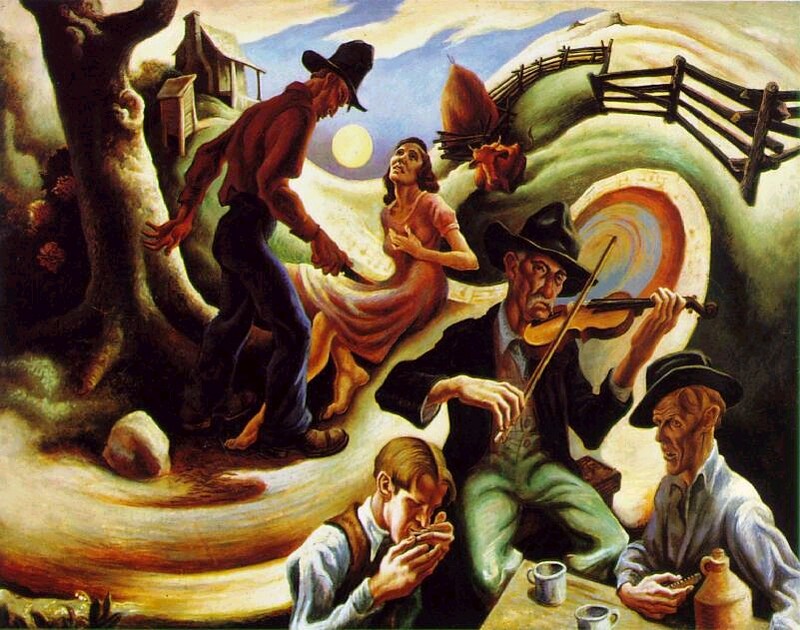 This Regionalist masterpiece by Thomas Hart Benton (1889-1975) includes a haystack, a cow, and an outhouse. It is a representation of an Ozark folk song, The Jealous Lover, but I doubt that the traditional lyrics refer to these extraneous elements. Okie Baroque is a term of derision applied to Regionalism in art, notwithstanding that the subject matter and the artist, too, generally operate at some distance from Oklahoma. OK, how does the painting make you feel? Dizzy? To me, it's "merely humorous." Obviously, the musicians in the scene conjure the scene, so we have to account for recursion in the composition. El Greco distortion allows some dramatic distance from the action; there's no transubstantiation expected; the painting merely epitomizes country music or the act of making it, anyway. The characters are paired. The intensity of the villain is mirrored in the harmonica player. The singer expresses the heroine's expression. All is done in the deadpan style traditional to folk-music performance. The performers distort a facsimile of reality without expecting to be caught in it. They depend on their audience to differentiate between story built of substance and reality from which substance is borrowed. Benton's figures are foreshortened as though you were to view them from below. To keep them from looming out of the frame, he uniformly positions the foreground behind a sill that the viewer must strain to see over. Note: The harmonica player is assumed to be Jackson Pollock. Discussion question: What is the mood of the cow? American flags flapped in the breeze Thursday at King Jack Park as about four dozen people clasped hands in circles of prayer. They prayed for unity. They prayed for guidance for national and local governmental leaders. And, they prayed for continued religious freedom and Christian reform. Similar prayers echoed throughout area towns at breakfast meetings and ceremonies in observance of the National Day of Prayer. This is the 54th year that the observance, established by an act of Congress, has folded the hands of participants on the first Thursday in May. "I'm all for this program," said Betty Lamb, of Webb City. "I think it's needful. I think unless we turn and hold up prayer before the Lord, our nation is in peril." Webb Citians have an appropriate site for the ceremony: at the foot of a hill where the Praying Hands statue was erected 34 years ago. The creator of the sculpture, Jack Dawson, and his wife, Nancy, were speakers at Thursday's event. "It's not a political statement but a spiritual one," Dawson said of the statue. 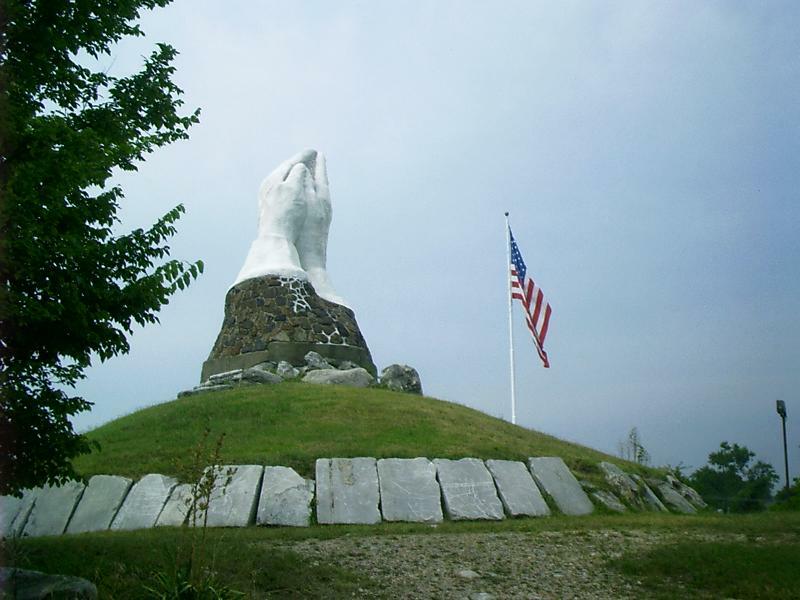 He said the folded hands that stand along Missouri Highway 171 represent a silent reminder every day that "humility before a living God is where we find that spiritual peace." The United States was founded on a number of precepts that include the right to religious freedom. The Founding Fathers relied on Christianity to underpin the nation they created, Dawson said. He quoted George Washington as having said, "It is impossible to rightly govern the world without God and the Bible." In the southeast corner of Kansas, stands this remnant of strip mining for coal. This shovel was parked on the verge of its last dig and decommissioned in 1974 after running day and night for eleven years. Its motors and hydraulic pumps were removed. In 1985, stairways were installed for tourist access. Because of insurance-company concerns, patrons are no longer permitted on the boom. 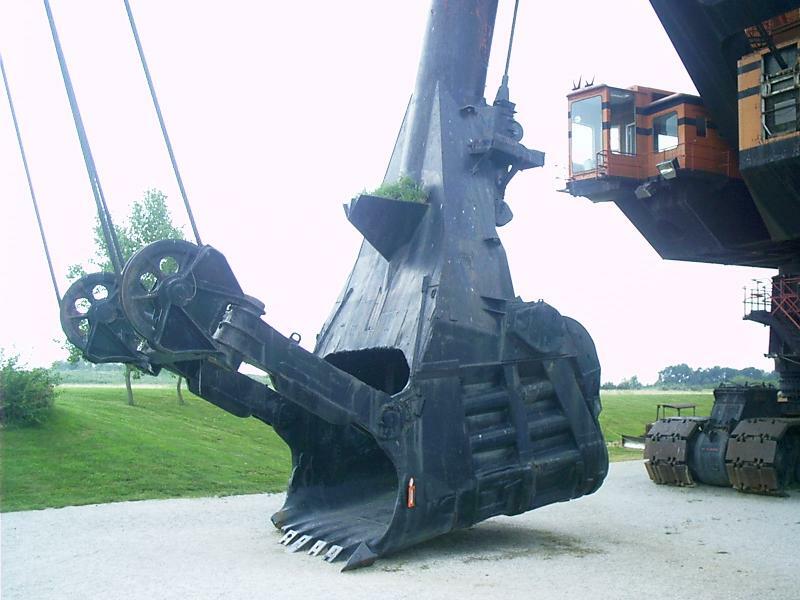 The model 1850-B, built by Bucyrus-Erie, is still the second largest electric shovel in the world. It ran off the end of a giant extension cord. Its final monthly electric bill was $27 thousand. The operator's cab was the nerve center of the shovel. The breakroom and operator's cab were air conditioned. 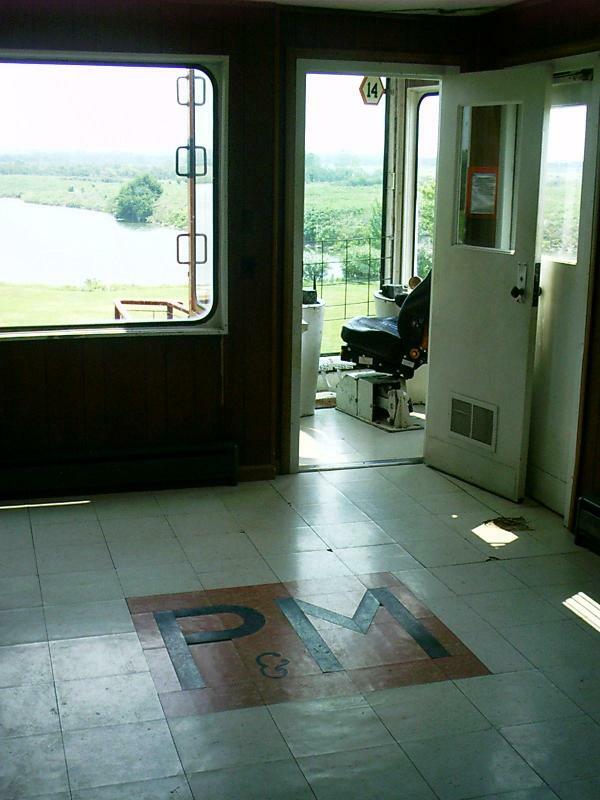 The monogram worked in the linoleum tile stands for Pittsburg and Midway Coal Mining Company. P&M paid $6.5 million for Big Brutus in 1962. The shovel required a running crew of only three: operator, oiler, and groundman. 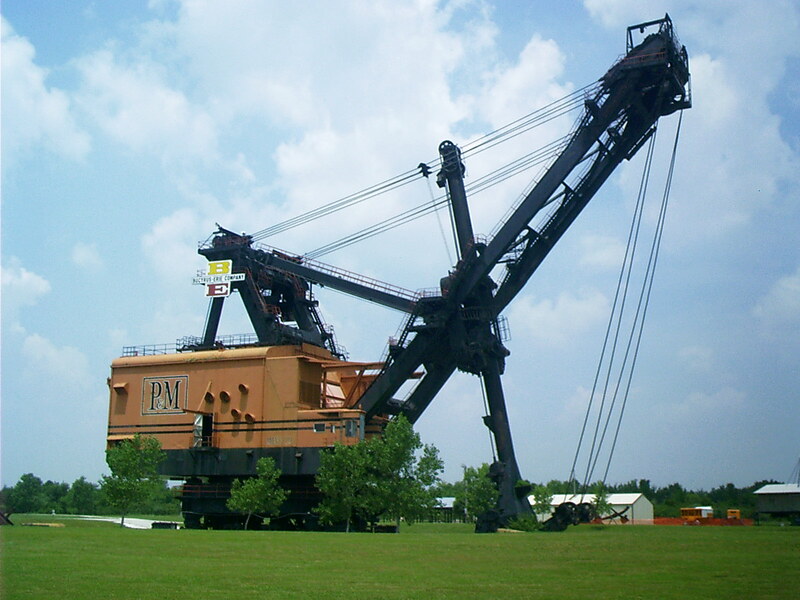 It was used to remove overburden from coal seams. The operator's cab projects from the corner of the house. The bucket held 135 tons or more. There are stunt pictures of workers' parking a pickup inside. The store was built in 1925. It was originally a Standard Station. By 1932, a Y Not Eat Barbecue had been added. 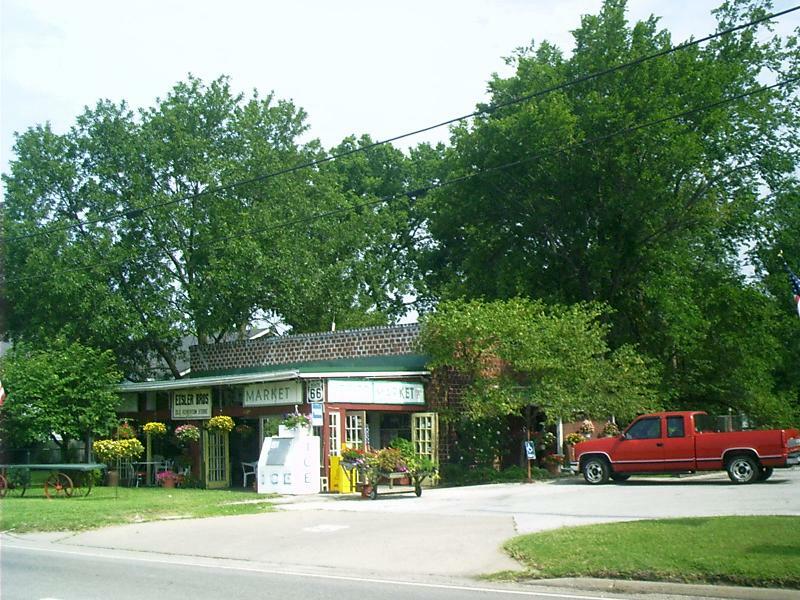 The Eisler family bought the location in 1973 and opened a market and deli. The old building is well maintained and still contains the original pressed tin ceiling. 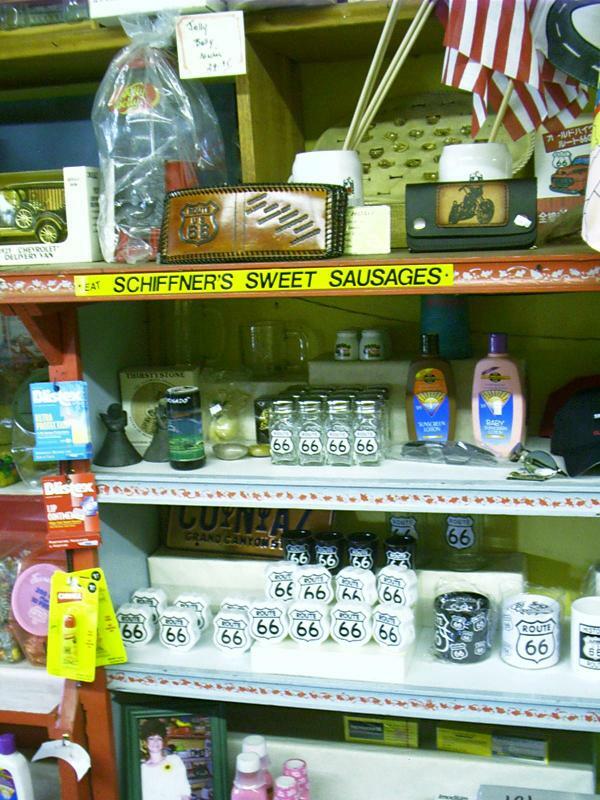 Stop here for all your Route 66 needs. Many travelers find the porch a convenient and pleasant place to hog down a sandwich and soft drink. 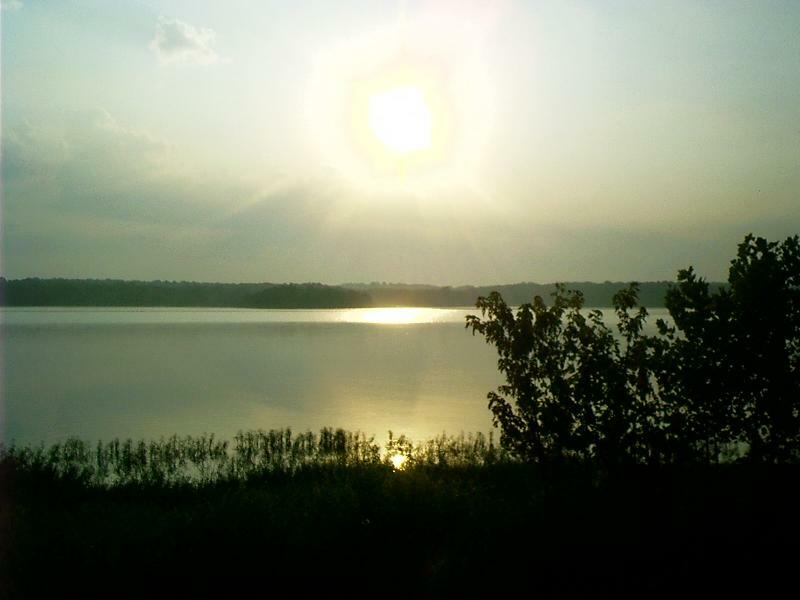 Heyburn Lake was named after the community of Heyburn, a post office from 1911-1922, located near the place where the St. Louis-San Francisco Railroad crossed Polecat Creek. 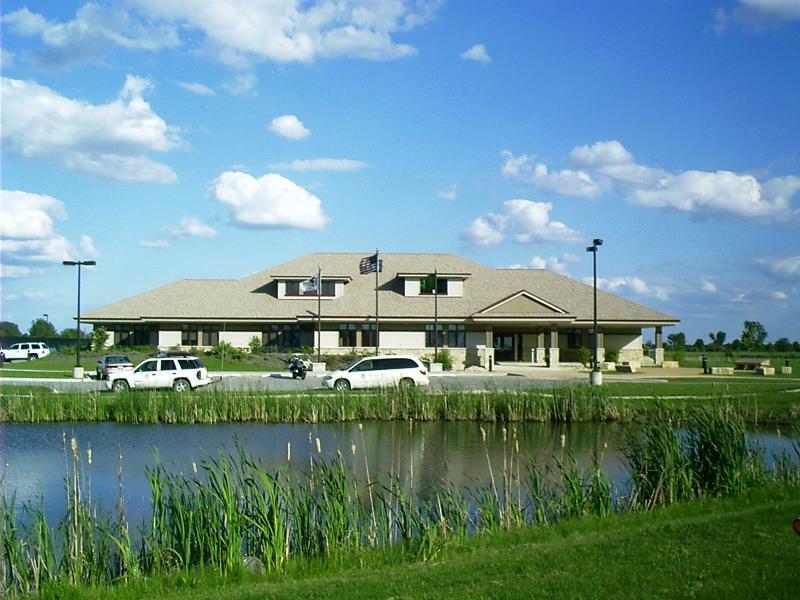 The project is located on Creek lands in the former Indian Territory. Many of the towns surrounding the project began as trading posts and developed as settlements as the railroads moved west. 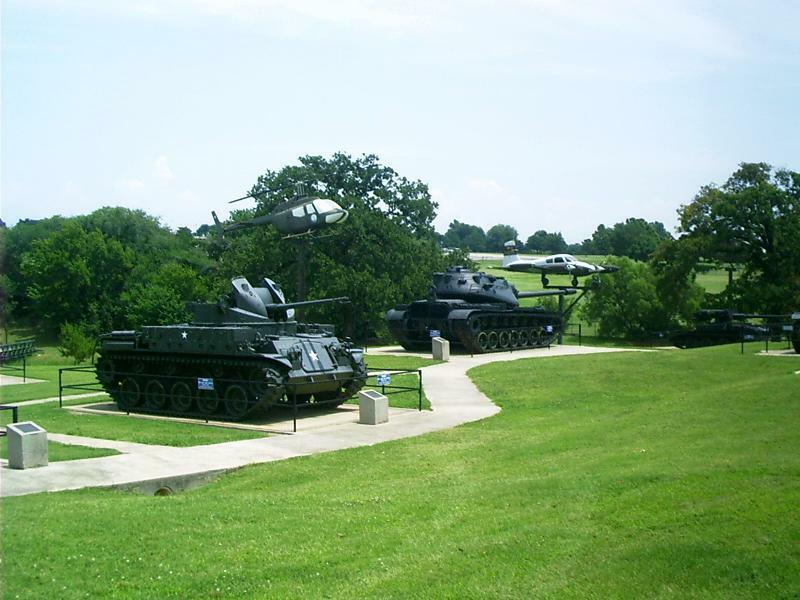 If you are into ordnance, be sure to visit the 45th Infantry Division Museum in Oklahoma City, OK. Outdoors, there's a pasture with lots of tanks, cannon, and aircraft. Indoors, there are guns, guns, and more guns. The history of firearms in warfare is pretty well covered with not one but several examples from every major conflict. Annotated displays compare and contrast the various specimens. Several exhibits at the 45th Infantry Division Museum deal with Indian Wars. One includes a map like this, showing where indigenous nations of the East were relocated during removal to the Indian Territory. I always imagined Oklahoma's being settled in a single land run starting at the Arkansas border. In fact, there were several rushes and lotteries over the years as tribal and unassigned lands were divvied up. It gives me pleasure to announce to Congress that the benevolent policy of the Government, steadily pursued for nearly 30 years, in relation to the removal of the Indians beyond the white settlements is approaching to a happy consummation. Two important tribes have accepted the provision made for their removal at the last session of Congress, and it is believed that their example will induce the remaining tribes also to seek the same obvious advantages. The consequences of a speedy removal will be important to the United States, to individual States, and to the Indians themselves. The pecuniary advantages which it promises to the Government are the least of its recommendations. It puts an end to all possible danger of collision between the authorities of the General and State Governments on account of the Indians. It will place a dense and civilized population in large tracts of country now occupied by a few savage hunters. By opening the whole territory between Tennessee on the north and Louisiana on the south to the settlement of the whites it will incalculably strengthen the south west frontier and render the adjacent States strong enough to repel future invasions without remote aid. It will relieve the whole State of Mississippi and the western part of Alabama of Indian occupancy, and enable those States to advance rapidly in population, wealth, and power. It will separate the Indians from immediate contact with settlements of whites; free them from the power of the States; enable them to pursue happiness in their own way and under their own rude institutions; will retard the progress of decay, which is lessening their numbers, and perhaps cause them gradually, under the protection of the Government and through the influence of good counsels, to cast off their savage habits and become an interesting, civilized, and Christian community. These consequences, some of them so certain and the rest so probable, make the complete execution of the plan sanctioned by Congress at their last session an object of much solicitude. Humanity has often wept over the fate of the aborigines of this country, and Philanthropy has been long busily employed in devising means to avert it, but its progress has never for a moment been arrested, and one by one have many powerful tribes disappeared from the earth. To follow to the tomb the last of his race and to tread on the graves of extinct nations excite melancholy reflections. But true philanthropy reconciles the mind to these vicissitudes as it does to the extinction of one generation to make room for another. In the monuments and fortifications of an unknown people, spread over the extensive regions of the West, we behold the memorials of a once powerful race, which was exterminated or has disappeared to make room for the existing savage tribes. Nor is there any thing in this which, upon a comprehensive view of the general interests of the human race, is to be regretted. Philanthropy could not wish to see this continent restored to the condition in which it was found by our forefathers. What good man would prefer a country covered with forests and ranged by a few thousand savages to our extensive Republic, studded with cities, towns, and prosperous farms, embellished with all the improvements which art can devise or industry execute, occupied by more than 12,000,000 happy people, and filled with all the blessings of liberty, civilization, and religion? Doubtless it will be painful to leave the graves of their fathers; but what do they more than our ancestors did or than our children are now doing? To better their condition in an unknown land our forefathers left all that was dear in earthly objects. Our children by thousands yearly leave the land of their birth to seek new homes in distant regions. Does Humanity weep at these painful separations from every thing, animate and inanimate, with which the young heart has become entwined? Far from it. It is rather a source of joy that our country affords scope where our young population may range unconstrained in body or in mind, developing the power and faculties of man in their highest perfection. In the consummation of a policy originating at an early period, and steadily pursued by every Administration within the present century~so just to the States and so generous to the Indians~the Executive feels it has a right to expect the cooperation of Congress and of all good and disinterested men. The States, moreover, have a right to demand it. It was substantially a part of the compact which made them members of our Confederacy. With Georgia there is an express contract; with the new States an implied one of equal obligation. Why, in authorizing Ohio, Indiana, Illinois, Missouri, Mississippi, and Alabama to form constitutions and become separate States, did Congress include within their limits extensive tracts of Indian lands, and, in some instances, powerful Indian tribes? Was it not understood by both parties that the power of the States was to be coextensive with their limits, and that with all convenient dispatch the General Government should extinguish the Indian title and remove every obstruction to the complete jurisdiction of the State governments over the soil? Probably not one of those States would have accepted a separate existence~certainly it would never have been granted by Congress~had it been understood that they were to be confined for ever to those small portions of their nominal territory the Indian title to which had at the time been extinguished. It is, therefore, a duty which this Government owes to the new States to extinguish as soon as possible the Indian title to all lands which Congress themselves have included within their limits. When this is done the duties of the General Government in relation to the States and the Indians within their limits are at an end. The Indians may leave the State or not, as they choose. The purchase of their lands does not alter in the least their personal relations with the State government. No act of the General Government has ever been deemed necessary to give the States jurisdiction over the persons of the Indians. That they possess by virtue of their sovereign power within their own limits in as full a manner before as after the purchase of the Indian lands; nor can this Government add to or diminish it. "I'm depending on you old men to be a steadying influence for the replacements." 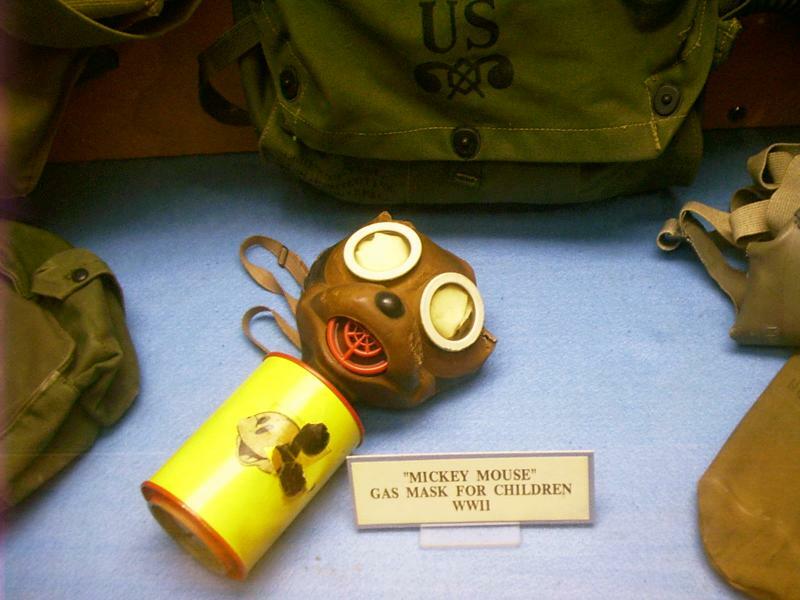 The 45th Infantry Division Museum houses a collection of original World War II cartoons contributed by Bill Mauldin, the artist, who served with the 45th Infantry in Italy. He created Willie and Joe, an Oklahoma Redneck and an Oklahoma Choctaw, a couple of grunts who endured the rigors of war up front together. They continually flirted with insubordination. Mauldin's drawings were always controversial. He had enemies in high places, but he had supporters, too, who must've felt he contributed to morale. Perhaps they were not so afraid of a little subversion as we would be, or perhaps they were and found it necessary to provide Mauldin's detractors a lightning rod to discharge their frustration. In this cartoon, Willie and Joe demonstrate that pop-psych manipulation is a two-way street. Overseas, Mauldin's work recorded war from a unique perspective; he drew war showing humor in the face of misery. By November of 1943 his cartoons were being carried in the Stars and Stripes, and by February of 1944 he was detached from the division and assigned to the Stars and Stripes for the duration of the war. He was awarded the Pulitzer Prize in 1945 for editorial cartooning, and the army honored his work by presenting him with the Legion of Merit. 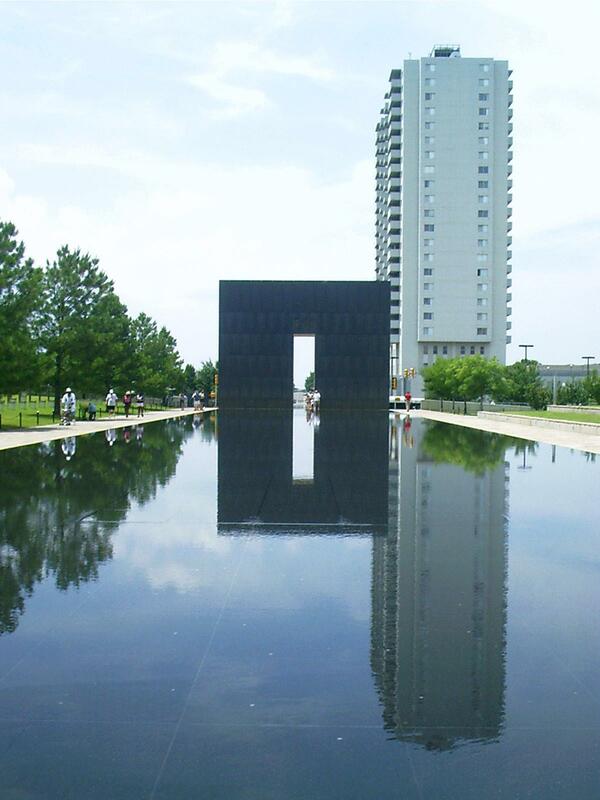 On 19 Apr 1995, the second anniversary of the Waco, TX, massacre, the 220th anniversary of the Revolutionary War Battle of Lexington and Concord, MA, and four years and a day before the Columbine High School, CO, massacre, a truck bomb set by Timothy McVeigh collapsed the facade of the Alfred P. Murrah Federal Building in Oklahoma City, OK. 168 people were killed and over 800 injured. 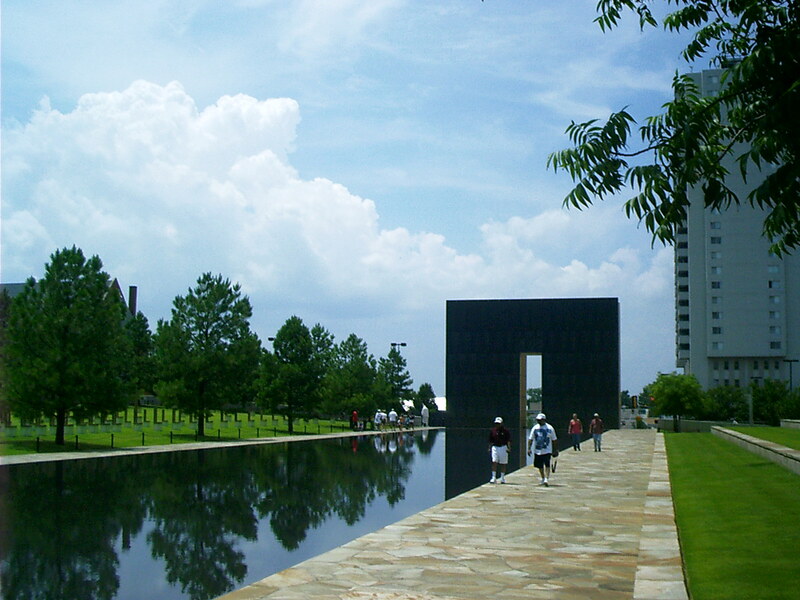 The Oklahoma City National Memorial commemorating the event was dedicated in 2000. 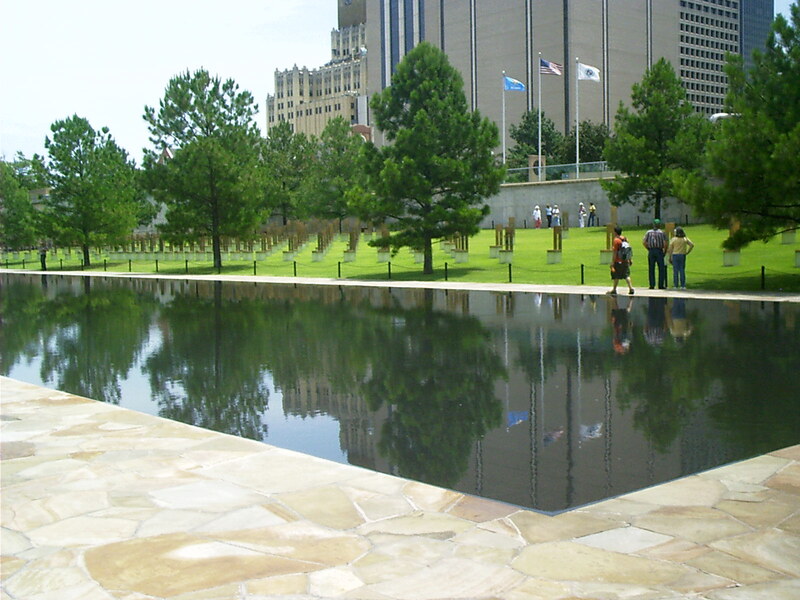 The reflecting pool occupies a portion of the ground where the Murrah Building stood. The black Gates of Time at either end are labeled 9:01 and 9:03, a minute before and a minute after the time of the blast. This is about how long it took the American public to decide there is a perennial threat of domestic terrorism. Specifications developed for new Federal buildings in years since now require street-level barriers and setbacks. Like an abstract set for the Thornton Wilder play, the Field of Empty Chairs holds 168 illuminated stools, each named for a victim of the bombing. 19 are tiny. These represent the children who were killed while attending day care in the building. "If I had known there was an entire day-care center, it might have given me pause to switch targets. That's a large amount of collateral damage," McVeigh said, according to an ABC interview. Rhode, Chuck. "Old US Route 66: Attractions." The Mother Road and the Natchez Trace. 4 Aug. 2005. Lacus Veris. 25 Apr. 2019 <">http://www.lacusveris.com/MotherRoad/Attractions US66.shtml>. Last modified 6 Oct. 2015 . Served18229 times between 16 May. 2010 and 24 Apr. 2019. Contact ">mailto:CRhode@LacusVeris.com?subject=LacusVeris.